There is a growing awareness of the importance of Revenue Assurance within the wireless telecommunications industry. The viability of an Operator’s business plan increasingly depends on capturing all of the revenue from their subscribers. This is driven by large investments for new spectrum, technology upgrades and new data services. It is critical to ask "Can I identify and capture the revenue I am losing?" Another driver for Revenue Assurance is liability concerns for over-charging subscribers. A Revenue Assurance Test System is a premiere solution for these concerns. This is demonstrated in an examination of a robust test solution with a broad coverage of revenue loss areas and billing accuracy, and a review of a real world case study. Are the services billed correctly? Revenue Assurance requires Operators to verify the accurate creation and processing of billing information. This ensures that the services used by subscribers are accurately reflected on their bills, including the applicable tariffs and the committed contract. It also ensures that bills do not reflect service that should not be billed (dropped calls, failed downloads, lost messages, etc.). Billing information is based on many factors, including the type of service, the amount of time or data used, and the subscriber’s selections (accessing voice activated services, downloading a game or ring tone, exchanging corporate e-mail, etc.). With the proliferation of new data services, there are many characteristics that increase the incidence of billing problems: frequent additions and changes in offerings, new and additional billing systems, unfamiliarity with event and content based billing, "converged" billing systems, etc. The affect of service quality on revenue recognition is often not as well addressed. When subscribers encounter services that do not work correctly or have an unsatisfactory level of perceived performance, the services will not be utilized and charges will not be incurred. Clearly, service quality must be managed in association with revenue assurance. How well can this approach address the real world problems leading to "lost revenue" within an Operator’s network? A recent study by Phillips identified the "areas of leakage" that are regularly experienced by Revenue Assurance groups (see Figure 1, from the 11/2003 Janney Industry Report). 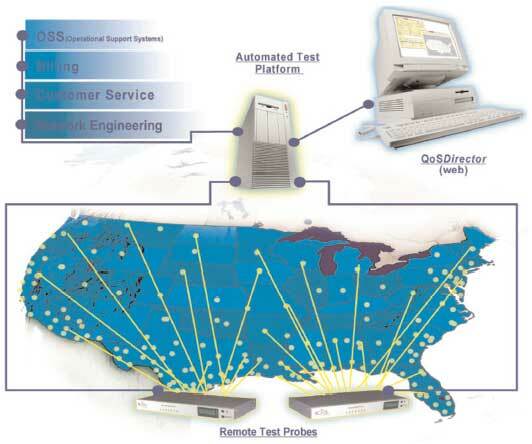 A valid testing approach identifies loss in these areas, leading to prevention and revenue recovery. The factors that cause these problems are vast, spread across numerous systems which are subject to frequent change (software updates, configuration changes, etc.). Records that cannot be processed in any element in the chain are "set aside" and do not get processed on time, causing them to be "late" or "lost" altogether. In other cases, the records are not created or get corrupted by subsequent "file errors," and the bill does not reflect the usage. By creating scenarios that emulate the causes of these problems, the testing process identifies which service records are not created correctly in a timely fashion and accurately reflected on the bill. Regular and comprehensive testing is required, since these problems occur frequently, usually under the oversight of work groups that do not coordinate their tasks. Example: A Switch software change that puts "different content" in a CDR field for caller ID blocking features may trigger the mediation device to send this record to the error file, and thus cause it to be sent to the billing system late or never processed. If the record is passed along, the value may not be accepted by the billing system. A service that is not provided successfully means the subscriber should not be billed in the same way. This demonstrates the linkage between quality of service and revenue assurance. Services that are "corrupted" prevent charging for the impacted service, contribute to the subscriber’s lack of use of the service, and could lead to churn. Conversely, serious legal implications (such as a class action suit) can result from over-billing subscribers and amassing an unknown liability. A capable testing process creates many of the "corrupting" events that subscribers experience. This ensures that the Operator’s system handles corrupted service properly. Moreover, a thorough testing strategy creates service usage that naturally encounters the real problems, in the same way that subscribers do. This produces an accurate measure of revenue lost from poor service quality, and detects revenue impacting problems sooner, thus limiting the impact. 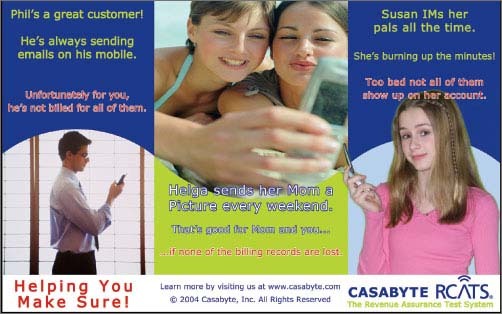 More importantly, it detects situations of over-billing. Example: A regular threat to revenue from SMS based services is the congestion that SMSCs experience, and the subsequent slow delivery or loss of messages. Performing a well-planned test campaign (good coverage of geography, service offering and time) quickly highlights service quality degradation before the revenue impact becomes substantial. Simultaneously, the lost revenue can be calculated. Determining the final charge for service is a complicated process that is highly prone to errors. This results in under-billing as well as over-billing (each with its own consequences). A test system creates service usage that covers the "rating" related aspects, and keeps thorough, useful records (with the information required to determine the charge). The records are compared against the network’s own rated records to determine discrepancies. Automating the comparison provides timely problem detection and minimizes the revenue impact. This is enhanced if the actual rating values are predicted, but this requires a great degree of sophistication (taking into account all factors contributing to the rating process: rate plans, billing cycles, taxes, etc.). Example: Certain services incur "premium" charges, such as roaming outside the home network. While this area experiences the standard problems of revenue assurance, certain features complicate this process; i.e. ensuring that services are billed at the roaming rate when forwarding from a home mobile to a roaming mobile. In similar fashion, Incomplete Customer Records and Fraud can be addressed (Debt Write-Off is not suited to this approach). Revenue impacting problems are detected much sooner, problems are fixed quicker, customers are happier and revenue is preserved.